Merry Christmas, Hyvää joulua, Frohe Weihnachten! Bach`s Christmas Oratorio in the beautiful Konzerthaus Berlin. Chateauneuf du Pape`s are for me winter wines par excellence. One of those wines you would like to open up on a quiet winter evenings beside a fire place, preferable after a long skiing trip. But I do have to admit that I`ve had a somewhat on-off relationship with them. Sometimes they can be a bit too warm and alcoholic, and also a tad pricey for the quality. 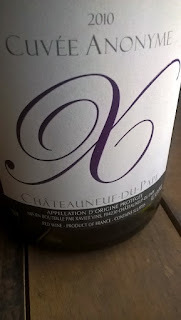 Furthermore there are nowadays many Southern Rhône wines outside CnP, that offer the same flavor profile and quality, with a noticeably lower price tag. But when good, they are one of the most interesting and delicious wines in the world. Absolutely intriguing, deep and layered aromas: loads of smoke, aniseed, forest floor, vanilla, rosemary, forest berries, quite a bit of barnyardy stuff, some animal musk. Smooth and supple, yet explosive and mouth filling on the palate, with strong acidity and tannins; fresh strawberries, forest berries, grilled meat, blood, beautiful garrigue notes. Long, herbal and smokey aftertaste..
One of the best CnP in a while..